Hayden senior Koa Cash pushes to pin his opponent Tuesday. He got the pin to win the match, helping the Tigers to a victory in a dual against Moffat County High School. Hayden — The fact that Tuesday night was senior night for the Hayden High School wrestling team was one of those funny quirks of the schedule. The bulk of the wrestling season is still ahead, and the all-important regional and state tournaments are more than a month away. But, it was the Tigers first and last home meet of the season, so it started with a celebration of the team’s seniors. It ended with one, too. 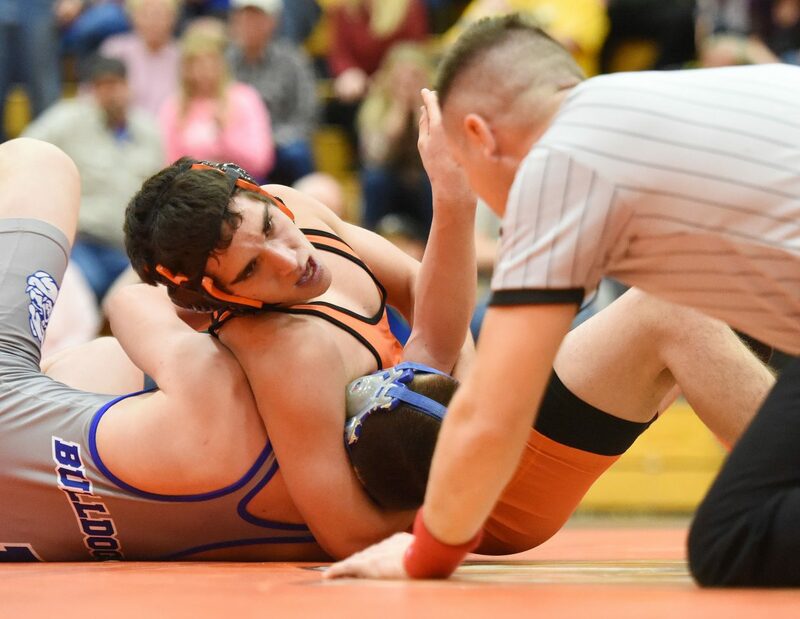 The Tigers pulled out a tight dual victory against Moffat County High School, relying on a few key late-match moves from some of those seniors to build a 36-34 lead the Bulldogs couldn’t overcome. Both sides won exciting matches, though Hayden’s added up to a few more points. The Tigers got big wins at 138 pounds, from senior Tate Montieth, who trailed 5-2 into the third period before pulling out a late pin against Moffat’s Drake Zimmerman. Hayden senior Koa Cash followed that up one match later at 145 pounds with a similar performance against Moffat County’s Elias Peroulis. Peroulis racked up a 7-1 lead in the match, but Cash erased all of that with another big, late pin. Kent Miller made it three senior pins in a row for Hayden, winning at 152 pounds in the first period. Senior Taylor Lewis added a pin of his own later at 195 pounds. “Give the credit to Hayden. They won it outright. They gave up points and still won it,” Moffat County coach Tanner Linsacum said. “We made some mistakes where we were winning matches then got turned. Those were big swings in points. That’s something we have to work on and get better at. “We got in bad positions, and Hayden capitalized on it,” Linsacum added. Hayden also got wins from Hunter Rummel at 220 pounds, 12-6 in a competitive match against Tanner Gilliland, and from Judd Magee at 113 pounds, 6-2 against John Peroulis. All that, plus a forfeit at 285 pounds, and Hayden pulled out a close win in the dual. That was thanks to plenty of solid wrestling from Moffat County, too. Linsacum pointed to the first Moffat win of the night, at 126 pounds and from Indy Byrnes. Byrnes was recently bumped up from junior varsity, and Tuesday he beat Hayden’s Brennan Guire. Issik Herod won a thrilling match against Hayden senior Tanner Guire at 132 pounds. The pair were knotted up at 7 in the final period, and Herod gave up the lead intentionally, letting Guire escape for one point and an 8-7 lead. Herod got the takedown he was after, however, took the lead back and ended up winning 11-8. Stelios Peroulis beat Hayden’s Christian Carson 4-1 at 182 pounds, and Karson Cox got a quick pin of Hayden’s Jake Planansky. “We had some good matches, and we wrestled tough. The matches we lost were against good kids, and the matches we won, we looked very solid,” Linsacum said.